Does anyone of you know, if there is a cap on Tier rewards? Or can you claim every reward after you have completed one single quest?! One quest, even if you fail, opens up all the rewards. I like that every member of the team reaps the same reward even if they weren’t able to give as much to achieving it as others could. We don’t all have the same amount of free time but as long as my folks are giving me a real effort I’m glad for them to have whatever reward is on offer. If they were denied those rewards I would be sad. They will need them desperately in the effort to catch up. If you are that annoyed at them, kick them before they logon. You know, I found out exactly who those members are based on the bountiful information in that screenshot. You should block out your rank, your score, and their profiles. I suppose your forum name would give it away anyway. 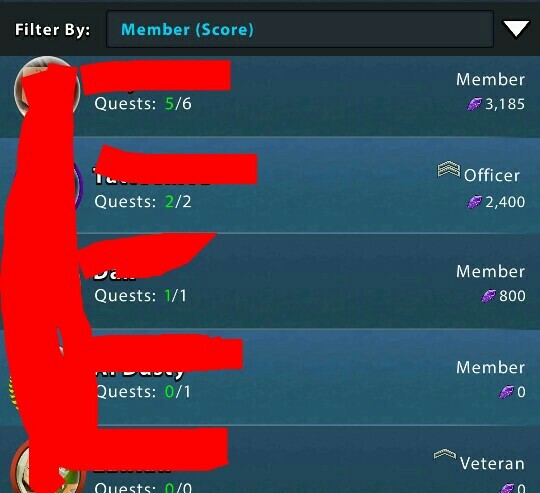 This thread reminds me of one you might find in DS Forum…recently even Guildies come and guildies go, sometimes on their own or no, but I go on forever!